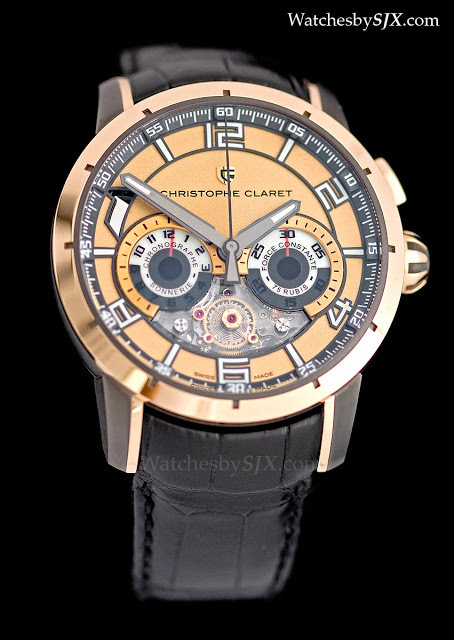 Unveiled at Baselworld 2013, the Kantharos is Christophe Claret’s entry level model, though it is far from simple. 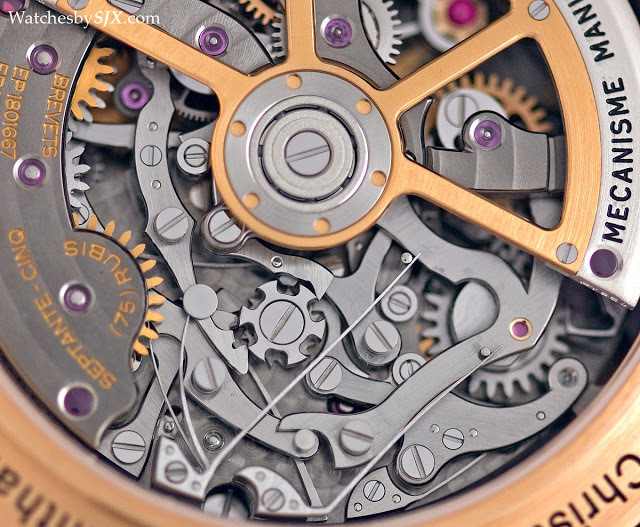 The in-house movement has a monopusher chronograph with a cathedral gong sonnerie, and a constant force escapement. 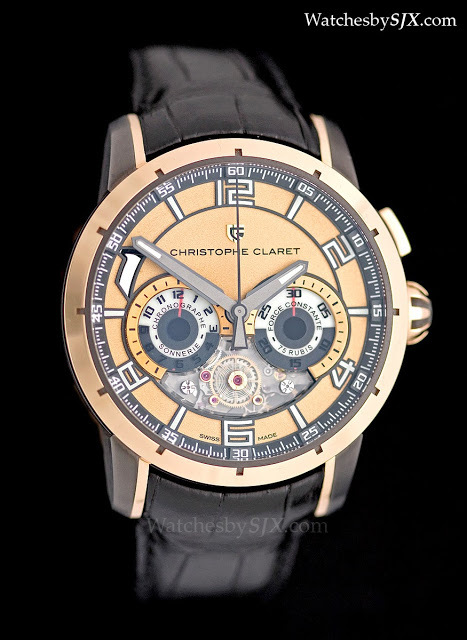 Christophe Claret is one of the pioneer movement specialists in watchmaking, having been a manufacturer of complicated movements for nearly thirty years. 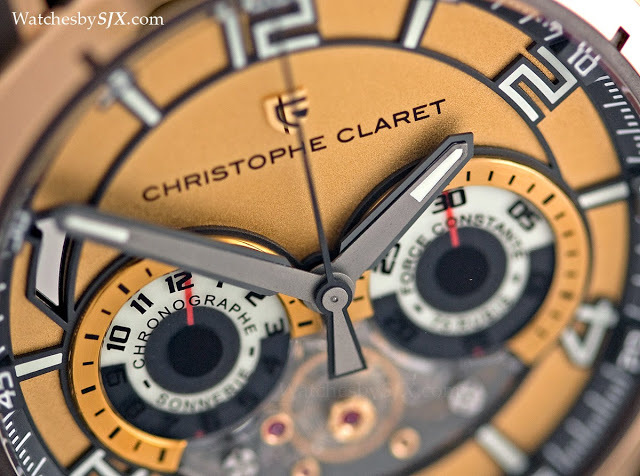 For most of that time, its clients have been other watch brands – officially the company says it has supplied movements to over 20 brands – but since 2009 Christophe Claret has made watches under its own name. 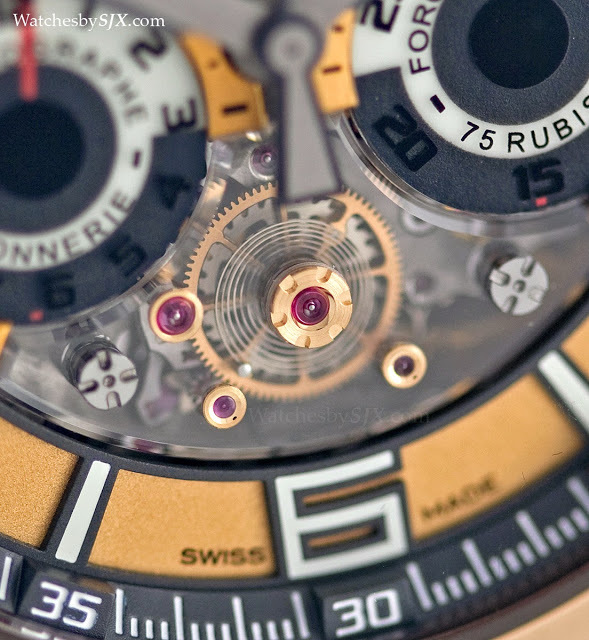 Most of those watches have been costly complications like repeaters and tourbillons. The new Kantharos chronograph is the first of a line of more affordable, or rather more accessible, timepieces. With the basic model retailing for CHF96,000 without tax (or about USD98,000), the Kantharos is about a third the price of the next most expensive model in the line-up. 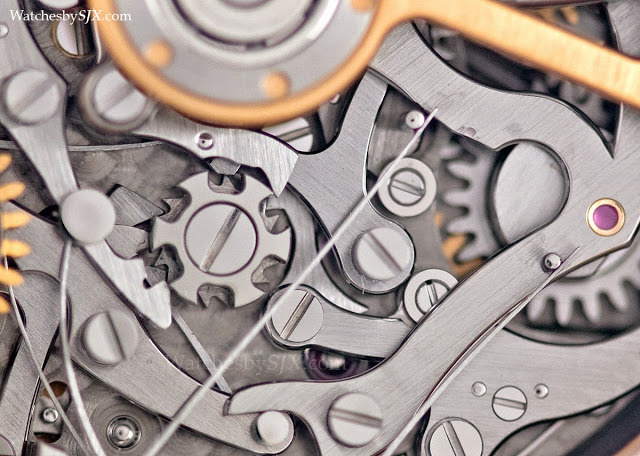 That being said, it is still a lot of money for a chronograph, but the Kantharos is more than that – its movement comprises 558 pieces while the average chronograph has half or less of that. 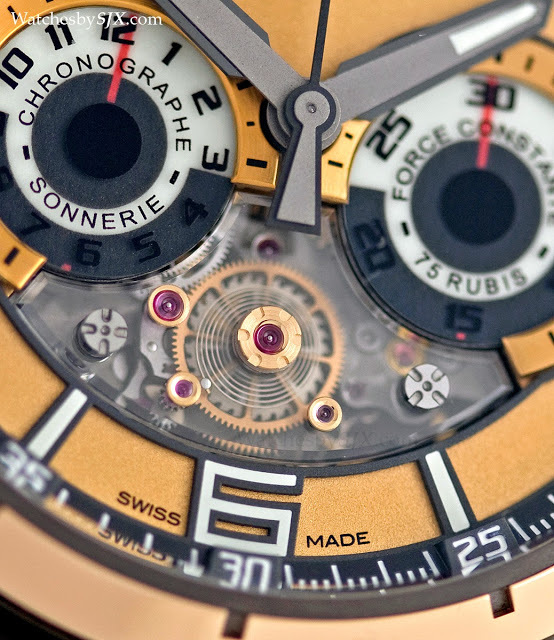 To begin with, it is an integrated, self-winding chronograph with a single button for start, stop and reset. 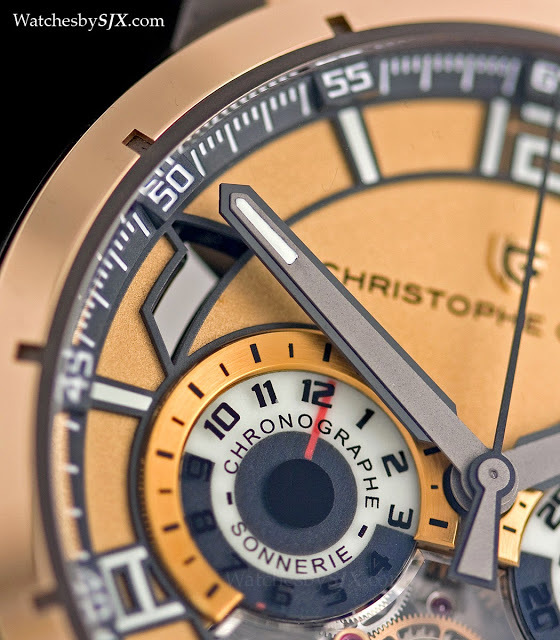 The chronograph has hour and minutes counters featuring rotating discs, with the elapsed time indicated by a red indicator. 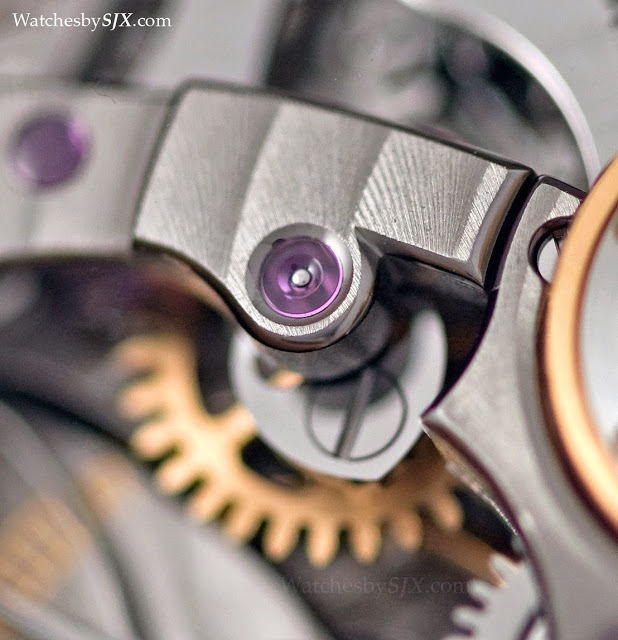 In addition, the chronograph pusher is linked to a sonnerie, or striking, mechanism. So each time the chronograph is activated, stopped or reset, the single hammer strikes the cathedral gong. Visible through an aperture at ten o’clock is the black polished hammer. The sonnerie is driven by the push button, which means pressing the pusher not only activates the chronograph but also the hammer. As a consequence, the pusher requires slightly more force than is expected. 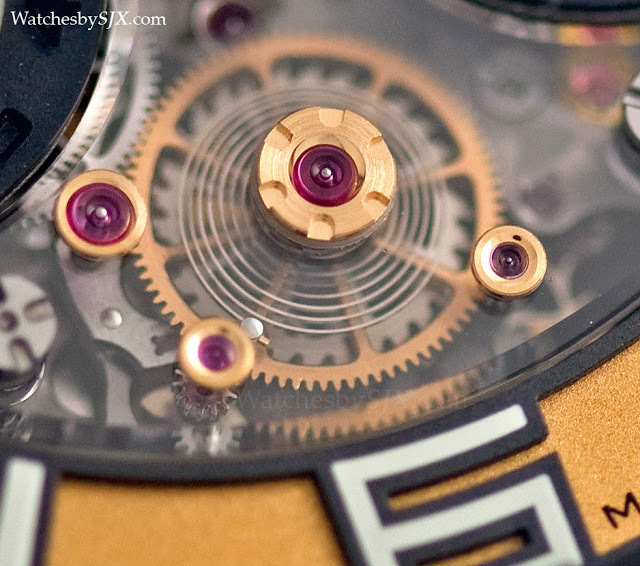 And visible at six o’clock on the dial is the tiny spring of the constant force escapement. 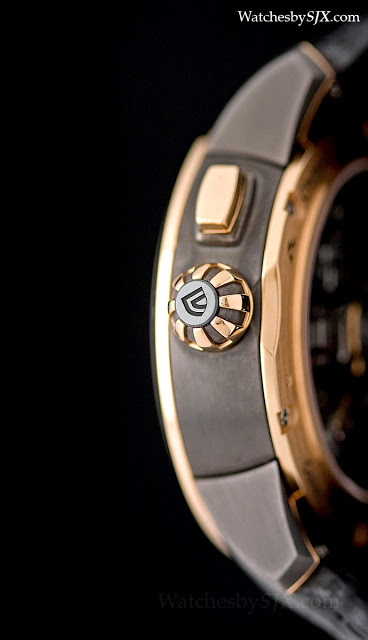 This ensures constant torque throughout the 48 hour power reserve of the movement. 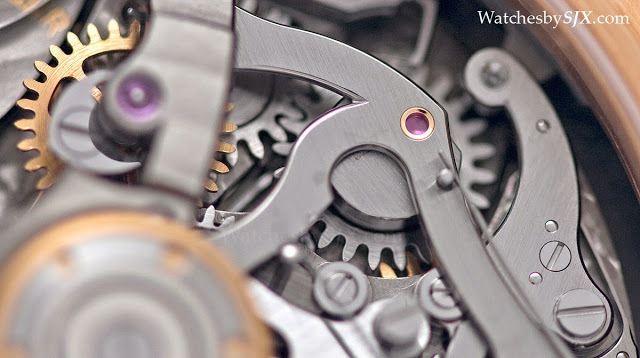 It is worth noting that the constant force escapement is purely for improved timekeeping at the extremes of the mainspring state of wind; it is not because of the chronograph. 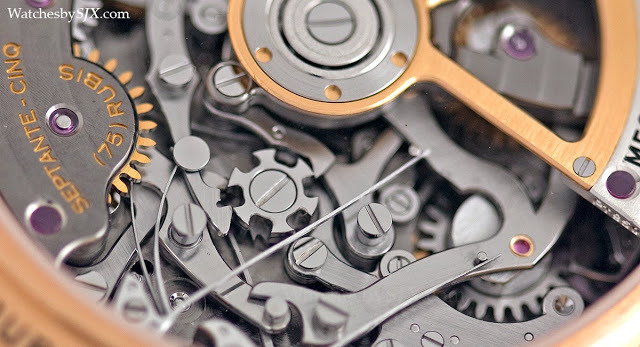 As the chronograph has a vertical clutch, meaning there is no drop in amplitude when the chronograph is running, the use of the chronograph has no impact on timekeeping. 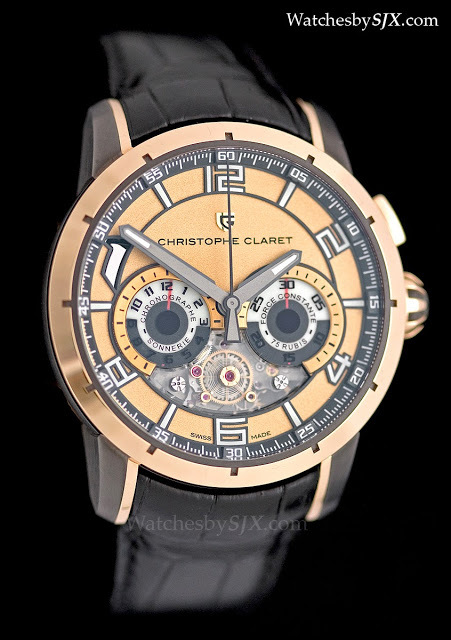 Christophe Claret is one of the most proficient and vertically integrated independent brands, so unsurprisingly the movement is almost wholly in-house, as is the case, dial and so on. In terms of fit and finish, the Kantharos is certainly up to par for the price range. 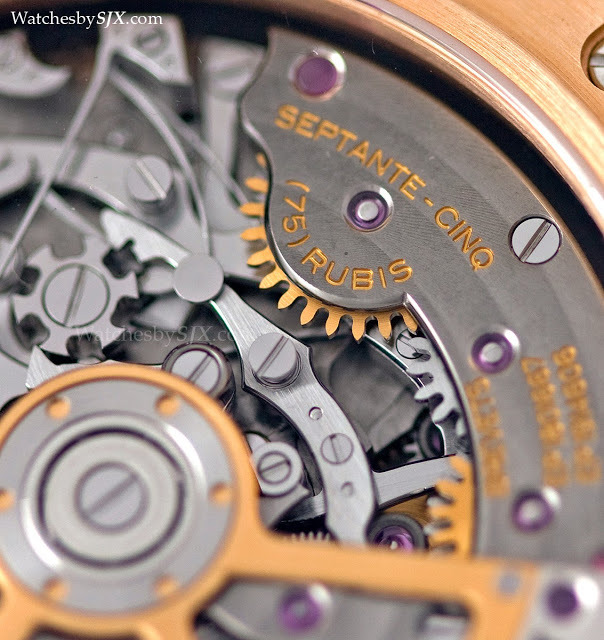 The movement finish is excellent, though not strikingly lavish. 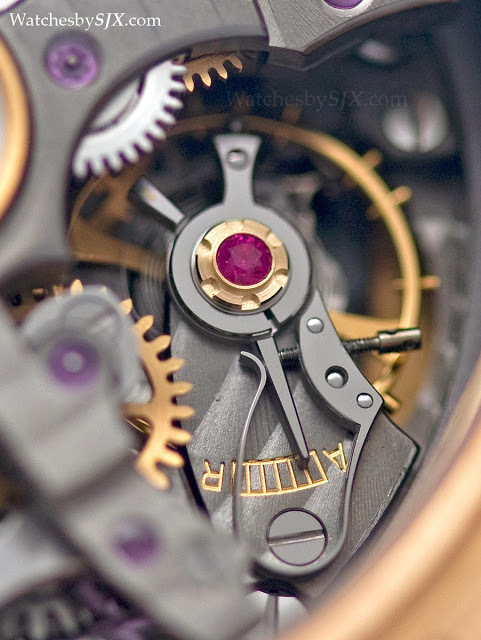 An interesting detail is the traditional swan neck regulator with a ruby end stone, an anachronistic detail in what is otherwise a modern looking movement. 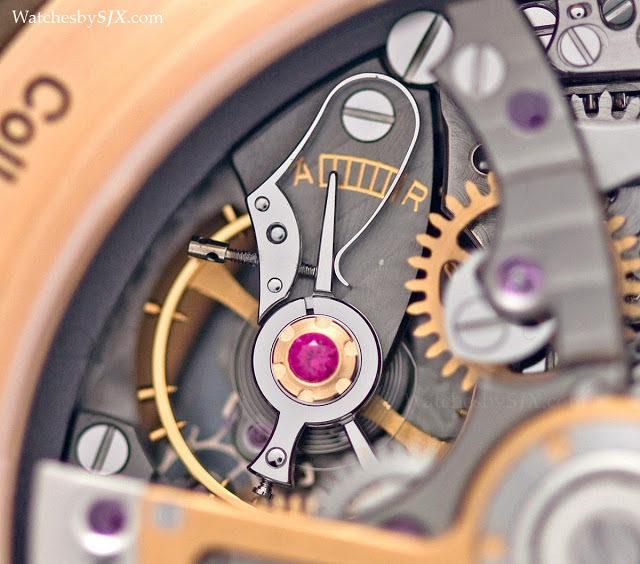 That reflects Claret’s roots; many of the calibres developed for other brands were inspired by vintage movements. 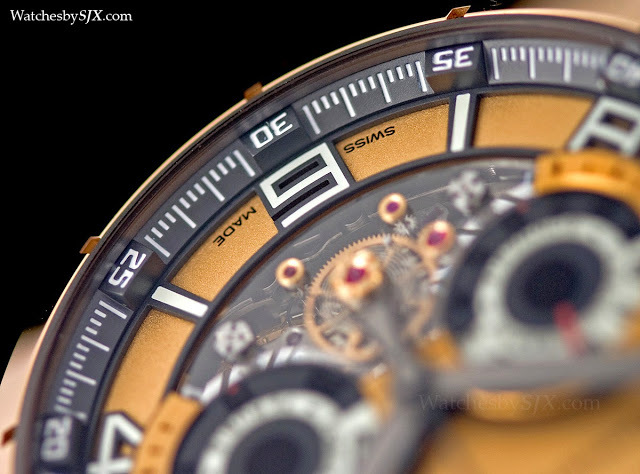 In fact, the case and dial are extremely elaborately constructed, with multiple layers and details. There is a lot of take in, if anything some of it is too complicated. All of it, however, is well executed and finished. The dial for example is on several levels; notice the tiny, raised platforms for the minute numerals on the outer minute track. 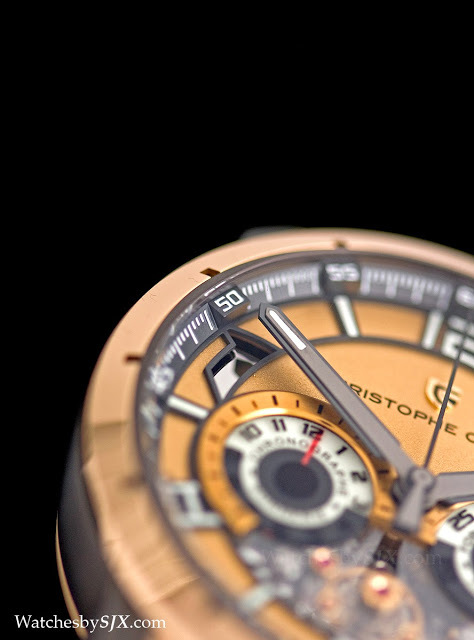 This particular version of the Kantharos has a pink gold dial with a beautiful frosted finish. 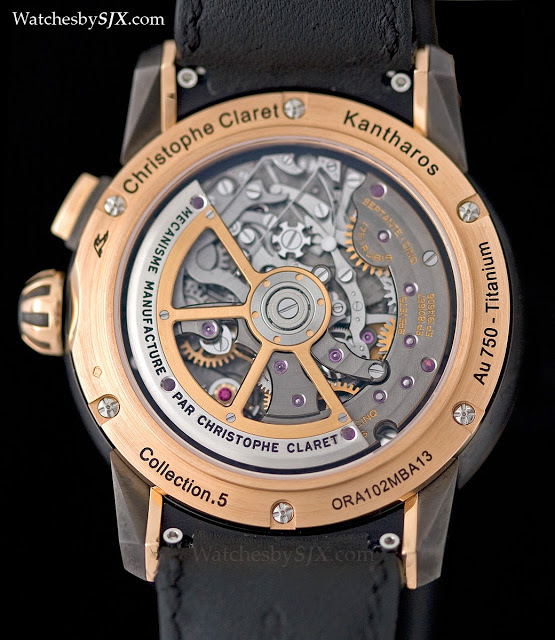 The Kantharos has a 45 mm case in titanium, with the options of rose gold elements and various colour treatments. 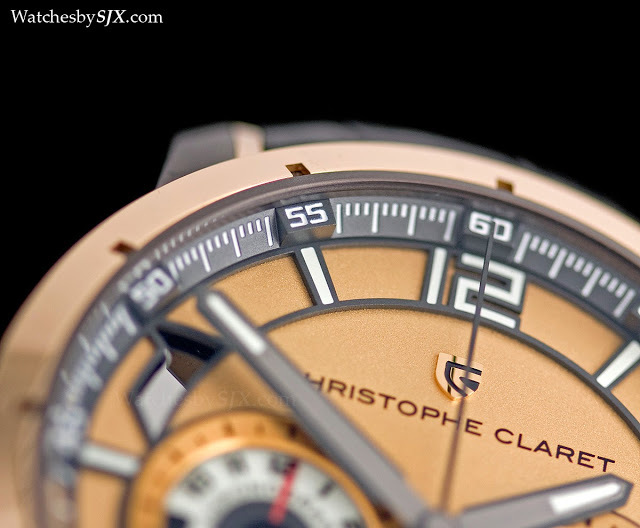 This version has a DLC coated titanium case with rose gold accents.